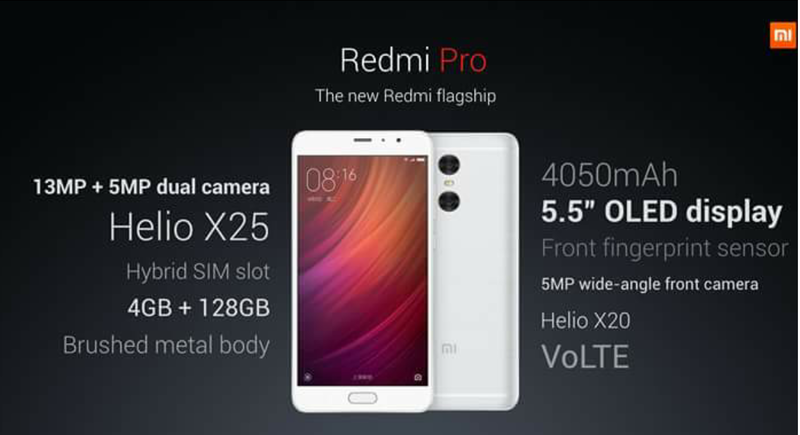 Xiaomi has launched Redmi Pro which is Xiaomi’s first dual camera phone. It is powered by Helio X25 10-core processor with 4 GB RAM and 128 GB internal memory. It includes a Mali-T880 graphics processor, coming to the camera section it contains 13MP + 5MP dual rear camera and 5MP front camera. Redmi Pro’s screen is 5.5” OLED display with 2.5D curved glass. Fingerprint sensor is embedded in the front button. Redmi Pro houses a 4050mAh Li-ion battery which is non removable and a hybrid sim card slot which means it can have either two sim cards or one sim + one memory card. Xiaomi Claims it be a phone with flagship-grade processor. Helio X25 is a deca-core 64-bit chipset with processing speed up to 2.5Ghz. Redmi Pro’s 5.5” screen is a Full HD OLED screen with 100% NTSC color granut and 60000:1 contrast ratio. 1. Mediatek Helio X20 with 3GB of RAM and 32GB internal memory priced at RMB 1499 or Rs15000 approx. 2. Mediatek Helio X25 with 3GB of RAM and 64GB internal memory priced at RMB 1699 or Rs17000 approx. 3. Mediatek Helio X25 with 4GB of RAM and 128GB internal memory priced at RMB 1999 or Rs20000 approx.